Scott has been making a Jonesey style KolorKing machine since the late 80s early 90s. The original KolorKing was built on the brass national copy of a Jonesy style machine with a yoke that Scott built at China Sea during the 80's and 90's while he worked with Mike Malone. China Sea was located at 1033 Hotel Street in Honolulu, which Malone purchased after the death of Sailor Jerry. After Scott sold out of the original, limited run Sailor Jerry Paul Rogers straight arm machines he decided he liked the geometry of that frame style so much he began to use it on the new Kolorking liners and shaders. This new version of the improved Kolorking shader has a traditional Jonesy style brace and a pinch tube Vice. The new improved version of the Kolorking is milled and drilled from a solid Billit of 1018 steel on a CNC mill for the greatest precision. The end result is a sturdy, well balanced and versatile machine for packing color or shading, hitting hard or very soft. 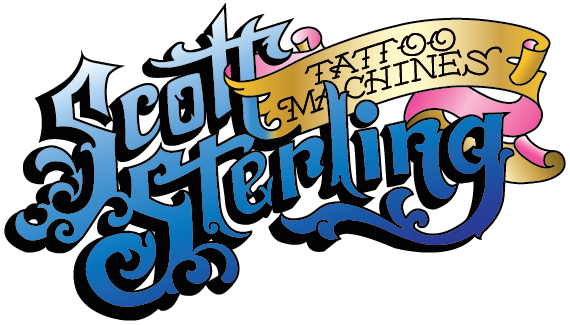 Each Sterling tattoo machine is run for 2 or 3 days to break it in and personally tattooed with on various body parts to ensure his highest level of quality.